Spread chickpeas over a parchment-lined baking sheet. Drizzle with 2 teaspoons of olive oil, and sprinkle with chili powder, 1/2 teaspoon of cumin, and 1/4 teaspoon of salt. Mix everything together using your hands. Set aside. In a small bowl, whisk together 1 tablespoon of oil, vinegar, 1/2 teaspoon of cumin, and 1/2 teaspoon of salt. Brush each mushroom cap with the oil/vinegar mixture and place them cap-side down on a second parchment-lined baking sheet. Place both the chickpeas and mushrooms in the oven. Roast for 10 minutes then stir the chickpeas and flip the mushrooms. Roast an additional 10 minutes, or until there are juices seeping out of the mushrooms and the chickpeas are browned and crispy. Set aside. While the chickpeas and mushrooms are cooking, start the cauliflower rice. Wash the cauliflower and remove the stems. Chop the head into quarters and grate each quarter using a box grater into a large bowl. You can also use a food processor and pulse the cauliflower in batches until rice-size grains are formed. In a large skillet, heat oil over medium heat and add the onion. Sauté until fragrant and beginning to turn translucent, 5 to 8 minutes. Add the garlic and sauté another 3 minutes. Stir in the cauliflower and 1 teaspoon of cumin. Allow the cauliflower to cook, stirring often, until it cooks down and turns golden-brown, about 10 minutes. Season with salt to taste and stir in cilantro, if using. Slice the mushrooms into strips. 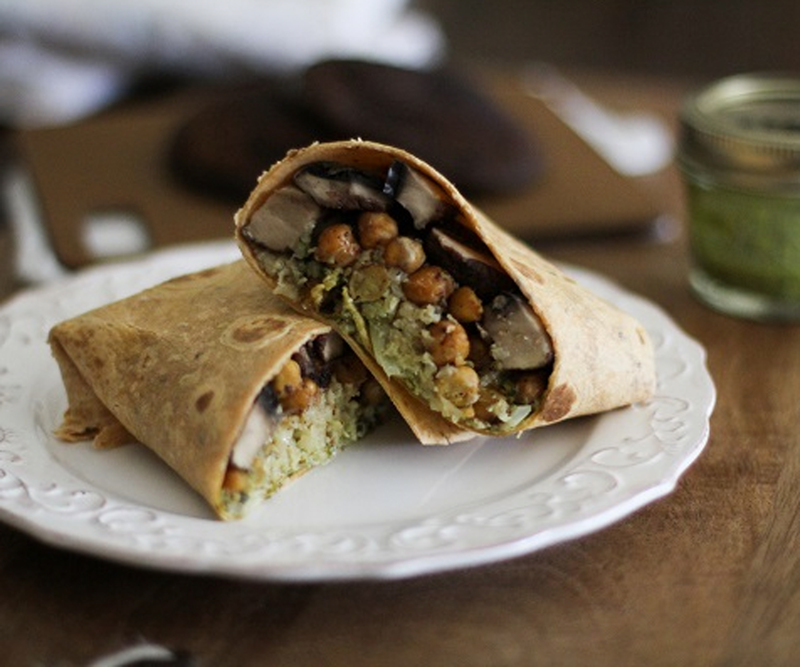 To assemble the burritos, add desired amount of portabella mushroom, chickpeas, cauliflower rice, chimichurri sauce, and other toppings to each tortilla. Roll the burritos and serve.